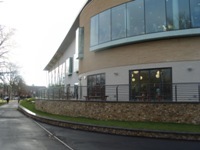 Services / facilities within the building include a main pool, training pool, confidence pool, sports hall, fitness gym, youth gym, multi-purpose studios, cycling studios, climbing wall, creche, children's soft play area, Verulamium Spa and a Cafe/Bistro. 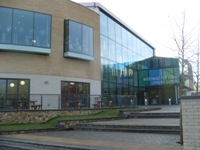 You are on Opening Times (Leisure Centre). Skip to the next section. The name of the car park is Abbey Theatre. The dimensions of the marked Blue Badge bays are 520cm x 380cm (17ft 1in x 12ft 6in). 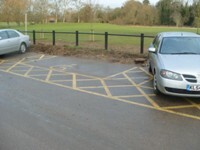 On street Blue Badge parking is located on the service road opposite the main entrance. The ramp or slope is located between the service road and the entrance. 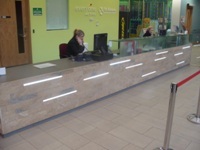 The reception desk is 11m (12yd) from the main entrance. There are turnstiles and barriers at the reception desk. 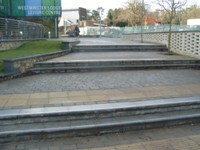 These are used to enter and exit the leisure centre. 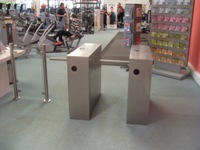 The turnstiles are 50cm wide and the barriers are 92cm wide. 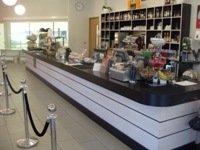 The turnstiles and barriers are swipe card operated, although this can be overridden by the staff on the reception desk. 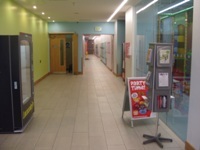 Music is played throughout the leisure centre. You are on Outside Access (Cafe/Bistro). Skip to the next section. This information is for the entrance located on the ground floor. 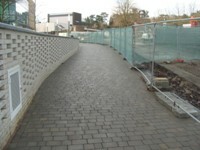 This entrance is push pad operated and the push pad is at a height of 90cm. You are on Inside Access (Cafe/Bistro). Skip to the next section. Music is played throughout the cafe. You are on Eating and Drinking (Cafe/Bistro). Skip to the next section. 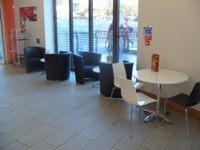 The nearest table is 3m (9ft 10in) from the ground floor entrance. 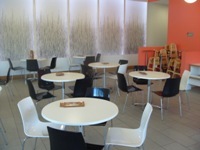 The type of food served here is breakfast, hot and cold meals and snacks. There is also an outside seating area, which is accessed through bi-folding doors. 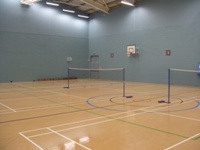 Within the leisure centre there is a multi use sports hall, used for indoor football, basketball, netball, badminton and volleyball. 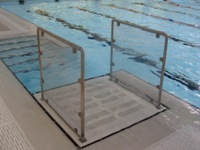 The main pool has a lift which can lower a wheelchair user into the water. 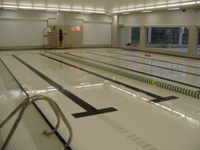 The floor in the main pool can be raised and lowered to a maximum depth of 2m. You are on Swimming Pool (Training Pool). Skip to the next section. 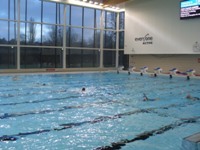 The floor in the training pool can be raised and lowered. There is also a confidence water area for children. 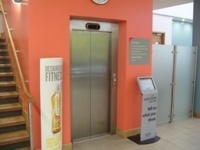 The lift is located opposite the reception desk. 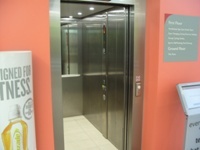 The dimensions of the lift are 205cm x 100cm (6ft 9in x 3ft 3in). 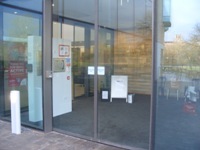 You are on Outside Access (Fitness Suite). Skip to the next section. 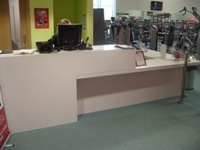 The reception desk is 2m (6ft 7in) from the first floor entrance. 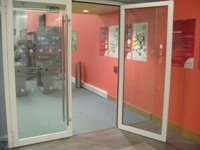 There are barriers and turnstiles to both enter and exit the fitness suite. 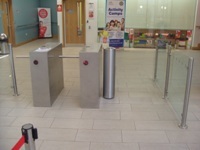 The turnstiles are 52cm wide and the barriers 90cm. 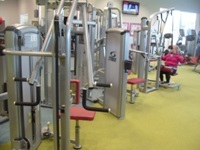 The fitness suite is 7m (22ft 12in) from the lift entrance. The opening is 180cm (5ft 11in) wide. 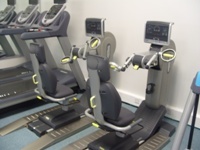 Equipment suitable for mobility or sensory impaired users includes cardiovascular machines and weight machines. You are on Group Studios. Skip to the next section. There are 2 studios located on the first floor. 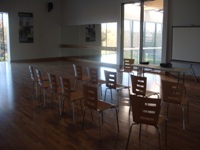 These can be used for dance and fitness classes or for meetings. You are on Changing Village. Skip to the next section. The leisure centre has a changing village. 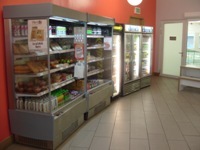 The changing village is accessed by automatic doors, which are double, open towards you and are 120cm wide. As you enter the changing village you are requested to use plastic overshoes which are dispensed from 2 machines fitted to the wall. The facility is located within the changing village. The dimensions of the facility are 550cm x 400cm (18ft 1in x 13ft 1in). The length of the bench is 184cm (6ft 0in). 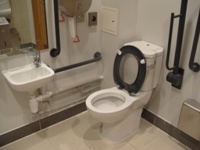 The transfer space on the left as you face the toilet is 300cm (9ft 10in). The type of sink is fixed. Wall mounted hand rails are available at the sink. As you face the sink, rails are available on both sides. 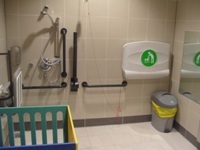 The changing places is also equipped with a baby changing facility. 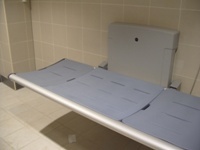 The baby changing table is at a height of 90cm. You are on Accessible Changing Room (Swimming Pool). Skip to the next section. 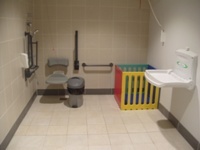 There is a Changing Places facility available. The accessible changing rooms are located within the changing village. The accessible changing room is 41m (45yd) from the main entrance. 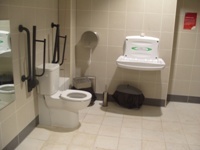 The accessible changing room is 21m (23yd) from the swimming pool. 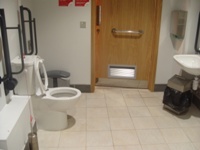 The accessible changing room is 30m (33yd) from the reception desk. 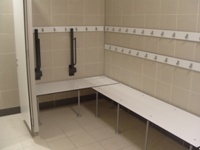 The dimensions of the accessible changing room are 350cm x 220cm (11ft 6in x 7ft 3in). 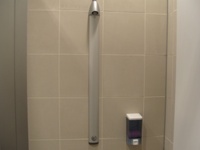 The facilities available in the accessible changing room are a wheel in shower, handrails and a ceiling tracking hoist. You are on Standard Changing Room (Swimming Pool). Skip to the next section. The standard changing rooms are located within the changing village. The standard male changing rooms are 18m from the swimming pool. The standard female changing rooms are 27m from the swimming pool. You are on Standard Shower (Swimming Pool). Skip to the next section. The showers are located within the changing village. There are standard showers located in the separate male and female standard changing rooms. You are on Accessible Changing Room (Sports Hall). Skip to the next section. 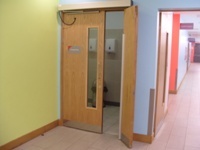 The accessible changing rooms are located off the ground floor corridor. The accessible changing room is 20m (22yd) from the sports hall. There are additional adapted changing rooms located on the first floor. The standard changing room is 51m (56yd) from the main entrance. The standard changing room is 40m (44yd) from the reception desk. 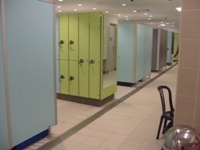 The standard changing room is 10m (32ft 10in) from the sports hall. 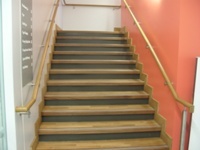 The standard changing rooms are located off the ground floor corridor. There are additional standard changing rooms located on the first floor. You are on Standard Shower (Sports Hall). Skip to the next section. 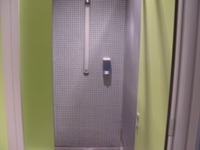 The showers are located within the standard male and female changing rooms. There are additional standard showers located on the first floor. 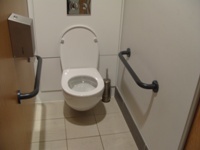 The accessible toilet is located on the left of the reception desk. 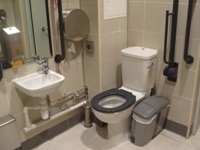 The dimensions of the accessible toilet are 580cm x 350cm (19ft 0in x 11ft 6in). 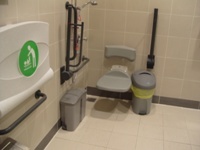 The accessible toilet is also equipped with a roll in shower, with a height adjustable shower head, twist/turn controls and a fold down seat. The seat is at a height of 50cm. There is also a ceiling tracking hoist which covers both the toilet and shower. You are on Standard Toilet(s) (Reception). Skip to the next section. The female toilets are located to the left of the reception desk. The female toilets are 25m (27yd) from the main entrance. The male toilets are located to the left of the reception desk. The male toilets are 25m (27yd) from the main entrance. 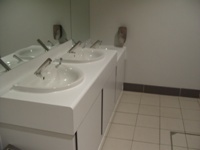 The standard toilets also have a low height wash basin. 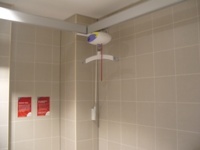 The photograph on the left shows one of the ceiling tracking hoists that are available in both the changing places facility and in the accessible changing rooms. 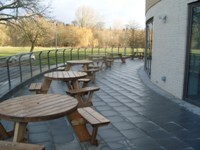 The photograph on the right shows the outdoor seating area for the Bistro.